I’ve been researching all things baby since long before we started TTC. While I don’t claim to know everything about parenting, I do know what baby gear is at the top of my list. 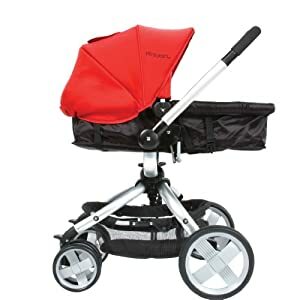 The First Years Wave Stroller has a seat that transforms from a bassinet to a regular baby/toddler seat and can swivel in any direction at the push of a button. It comes with an infant car seat adapter for those times when baby falls asleep in the car on the way to… wherever. It is stylish and affordable and I just love it! The Ikea Antilop high chair encompasses my key requirements for baby gear: cheap, easy to keep clean, and not hideous. Actually, we just bought one of these last weekend. Too early? Yeah. But we were at Ikea and got a little excited. We got the tray too, which brought us up to $25 for our first baby purchase. Big spenders! The Puj Tub seems like a stupid choice, but it is more than a piece of foam for $40. It is a space saver, a baby bath time cradler, and a parental posture preserver. Some people might not mind bending over a tub to bathe a newborn, but I’m not one of those people, especially if a bath becomes a part of our bed time routine. This allows us to bathe the little one in our pedestal sink and hang the tub flat on the back of our door. The Moby Wrap is the ultimate hippie mom baby carrier. Perfect for grocery shopping, dog walking, or any other activity where your hands need to be free (Jenna loves it for traveling), the moby keeps baby close and secure with nothing but comfy fabric. The Summer Video Monitor is perfect for anxious new parents. I fell in love with video monitors when I started babysitting for some friends when their little girl was a year and a half. Even when she was old enough not to need it, I would still turn it on if I heard a strange noise or just to watch her sleep. It’s extremely comforting to be able to check on the baby without risking waking her up. I knew I would be adding this baby to my registry when it was time. What do you think of my top five baby items? What are yours? Disclaimer: none of these companies paid or perked me to say these things, but if they decided to send me free stuff, I wouldn’t be sad. Love your choices! I really want a PUJ tub, but I know they're only useful for the first 3 months, so I'm having a hard time justifying it over another tub. But I love the concept so much it's hard to let it go. I love all your choices…. I didn't know first year had the adapter for the car seat…. Now it's my first choice!